With WELLER ST7 For sample ,We made other models ! In order to adapt to different welding spot . This is 5pcs pack tips that can replace weller ST tips,not OEM but of high quality. Compatible with WP25, WP30, WP35, WLC100 SP40L / SP40N series soldering iron. Consist of a special sharp conical tip, size 0.2mm. chisel tip size 2.4mm . 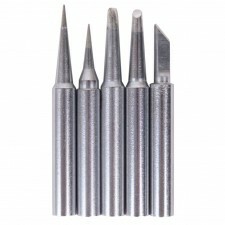 with 5 different shapes and sizes,this speical customized tip set can achieve almost any soldering application you need.